Alexandra Bochova with Jewish War Veteran Paul Ouslander. Photo: Dan Benau. It was an amazing contrast: a beautiful, mild Sunday afternoon outside on Veterans Day, November 11, 2012. But inside Temple Beth Hillel-Beth El, Wynnewood, was honoring some special heroes of World War II who liberated concentration camps in Europe and witnessed some of the most heinous crimes in human history. In an incredibly moving program, before an audience of 225, including many students and scouts, tribute was paid to the African American soldiers of the U.S. Army who liberated the camps, many of whom were members of a segregated unit known as The Red Ball Express. This program, as in past years, was the brainchild of Ed “The Sage” Snyder of TBH-BE, and co-sponsored with the Israel Advocacy Committee and Mens Club. Special guests in attendance were from the neighboring Zion Baptist Church of Ardmore, and many survivors, liberators and prisoner of war, war veterans, Jewish war veterans and American Legion. The program began with Cantor Eugene Rosner leading the audience in the National Anthem. The Zion Baptist Church Choir then led a soulful rendering of the America The Beautiful. Acting as M.C., Ed began by remarking how important it was that the students and youth, especially, learn and appreciate this important history- which is not being taught and has all but been forgotten. He also stated, almost incredibly, how much resistence he received from various groups and organizations in trying to put this program together. Rabbi Neil Cooper next gave warm welcoming remarks to the veterans, liberators and the sizeable audience from the African American community, stressing the historic relationship and kinship with the Jewish community, both of whom emerged from slavery into freedom. Temple Beth Hillel-Beth El President Pam Feld Randel then thanked the community for coming together at the synagogue to celebrate this special occasion. Alexandra Bochova. Photo: Richard Chaitt. The first guest speaker was Alexandra Bochova, who joined the Russian Army at age 15, fighting through Eastern Europe and eventually liberating concentration camps with the Red Army. Her story was fascinating, and she wished she had more time to tell it. 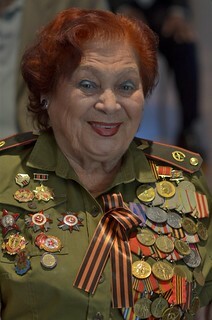 She came dressed in her splendid army uniform chocked full of medals. She spoke in Russian, which was translated by Marina Furman, a former refusenik and the current director of the Jewish National Fund in Philadelphia. The Reverend James Pollard of Zion Baptist Church then spoke grandly and eloquently about honor and duty, and that this history is not only not being forgotten, but in fact his church has established a library and resource center about it. 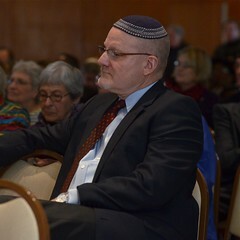 He also praised the connection and shared history of the Jewish and African American communities. A short section of the film, Red Ball Express was then shown and introduced by Dan Benau, the son of a survivor. Dan is a movie and history buff on the Holocaust. Arthur Seltzer, a veteran with the U.S. Army, who received innumerable medals and awards, and fought in the Battle of the Bulge and was a liberator who spoke at last year’s program, introduced the keynote speaker, Dr. Leon Bass, a robust man of 87. It was very clear when Dr. Bass spoke that the audience was enraptured, by his cadence, confidence, and message. He was a young man from West Philadelphia, enlisted in the army, went down south for training and was shocked at the segregation and disdain of the African American soldiers, but he stood tall. He came to realize that his superiors and the culture deemed that he, an African American, was “not good enough” but yet expendable to fight for America. He was sent to Europe and told his story of fighting his way in the segregated African American units, and surviving while seeing death and destruction all around him. One day while they were in Germany, he was suddenly told by a superior officer to come with him to a concentration camp. He had never heard of such a thing, and was wholly unprepared for what they were to all see when they arrived to open Buchenwald. The most horrendous scene he could ever have imagined, he was an eyewitness to it all: the decrepit camp, the stench, the “walking dead”- nothing but skin and bones in pajamas, people who were barely alive, the crematoriums and gas chambers. It occurred to him that these innocent people were considered by the Germans to also “not be good enough to live.” It haunts him to this very day. Ultimately, he came home, finished his education, became a principal of Benjamin Franklin High School. One day in the early 1970s, a woman survivor came to school, and he was encouraged and inspired from then on to speak, speak out, and tell his story, which he has been doing ever since and vows to continue until his last days. The audience was spellbound. He is a real treasure. Rabbi Neil Cooper. Photo: Richard Chaitt. Ed then introduced the veterans and liberators in attendance, and paid respects to those from the community who had died in the past year. Unfortunately, too many of these heroes are dying with greater frequency, leaving fewer live eyewitnesses. My son, Noah Bender, a high school student, then concluded the program at our synagogue by playing taps. Many in the audience from the two communities stayed late afterwards to enjoy refreshments, meet and interact. The program was videotaped for future preservation. Keynote speaker, Dr. Leon Bass. Photo: Richard Chaitt.